You may recall on the destructive Typhoon Yolanda that swept through Tacloban , Philippines last year and our club sponsorship of USD2000 to jointly rebuild homes for 8 affected families with RC Makati North. Here below email (with photos) is from RC Makati North IPP Chris who made a special trip to visit these 8 families in Oct and sharing with us a brief trip report . On 18 October, 2014, I traveled to the city of Tacloban, Philippines devastated by super typhoon Yolanda in November 2013. The purpose of my visit was look at the eight homes that were built with the funds that the Rotary Club of Macau contributed to the Rotary Club of Makati North, which were then handed over to the Springboard Foundation to implement the construction of eight new homes for indigent Filipino families affected by Yolanda. 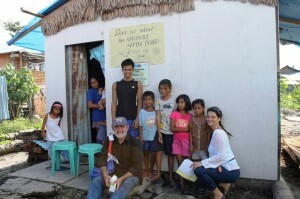 I traveled to Tacloban with Ms. Annette Helbig, the President and CEO of Springboard Foundation who supervised the project with their staff on location. The trip to Tacloban from Manila took me 70 minutes by air. The project site is about 30 minutes from the airport. While there has been much reconstruction of the city, there are sill visible signs of the damage caused by the super typhoon. People are still living in UNHCR tents. There is also still visible signs of the enormous power of the super typhoon. You will see in one photo the impact of the wind on palm trees. I am told that the water reached the top of some of these trees. With the help of Springboard and its staff located in Tacloban, I visited all eight homes that you helped build. I met the families. The families who occupy the homes were grateful for their new homes as shown with some of the signs that they had place on the front of the buildings. I was shown documentation by Springboard for each family. The documentation describes their needs (I.e. building materials), a certification from the local authorities that the families are occupying the homes, a list of the family members and their age, and a certification that the families are authorized to live on the land where the homes are located. Each home shows prominently, a small sign, mentioning the names of the Rotary Club of Macau and the Rotary Club of Makati North as responsible for the funding of the new homes. Springboard recommended that we bring with us vitamins that we distributed to both the adults and the children. I also wish to thank my wife Michelle for supporting my visit to Tacloban yesterday. I invite you to visit my Facebook at Christophe Bellinger to look at the photos that I and Annette Helbig took of our visit. I expect that RCMN will take some of these photos to place on our Club’s own Facebook page. For now, I attach a few of the photos. I trust that this summary of my visit to Tacloban and our joint project will meet with your satisfaction. While you will see many smiles in the photos, there is still much to do in Tacloban. On behalf of our President, George Mercado, I wish to thank you, the President of RC Macau, Elizabeth Fong, and your members for supporting this important project that has had a positive impact of the lives of the people that you see in the photos. Please feel free to let me know if you have any questions about my visit to Tacloban and our joint project.